as you have brought peace to Ibrahim and his family. Truly, You are Praiseworthy and Glorious. as you have blessed Ibrahim and his family. .إِنَّكَ حَمِيدٌ مَجِيدٌPlease Darood sharif ko Drost tarike se lekhain, Yeh Darood sharif galat likha gia hai, Jald thik karin , Mehrbani hu ghi, Jazak Allah. 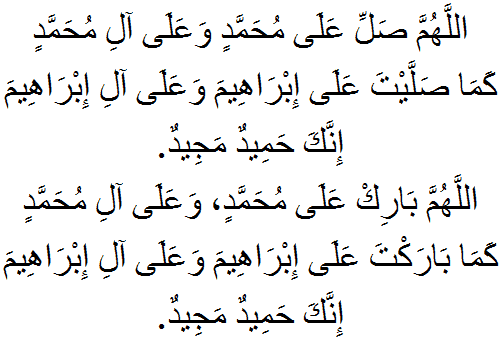 this Durood was in Arabic script, not Urdu script. Arabs read it the same way. Sahi Tareeka hai. My friend darood shareef in Arabic is not only for Arabs but also for all Muslim community….. Every Muslim read darood shareef in Arabic so if a new comer or new learner or beginner reads this darood shareef they will also be affected with the wrong pronunciations of darood shareef and he will not be a sinner of this rather one who is updated will be the responsible and who ever supports this scrip writing. So plz don’t have ego for Allah and his beloved rasool… This is in Internet my friend so not only Arab but also everyone across the world can read this.So plz plz make a correction. Zazakallah…. Allah mujhe aur aap sab ko hidayat De…. I request for Khalaq ke sarwar lyrics and translation in English and Urdu. Darood-e-Ibrahim is a great gift for all the Muslims around the world to show their unlimited respect and love by sending this Durood-e-Ibrahimi daily on Prophet Muhammad (P.B.U.H).